A teaser is exactly as the name suggests. It is the snapshot of a company. 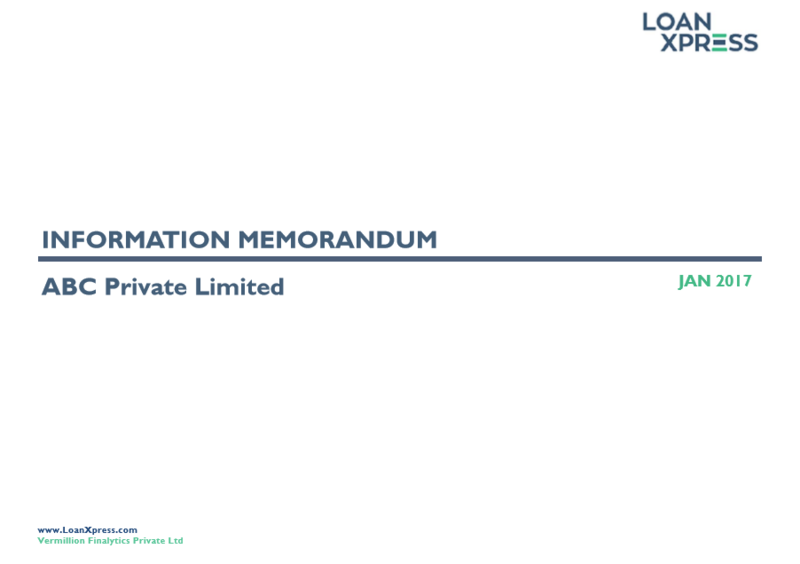 It generally includes the company details, the promoter details, the credit facility that the applicant wants to avail of, his existing loan details, the details of the collateral being offered, tenure of the proposed loan, the financials of the company etc .It is a 6-7 pager document. A teaser will have enough information to enable the lender to decide if he is interested in lending or out, yet it withholds the details. 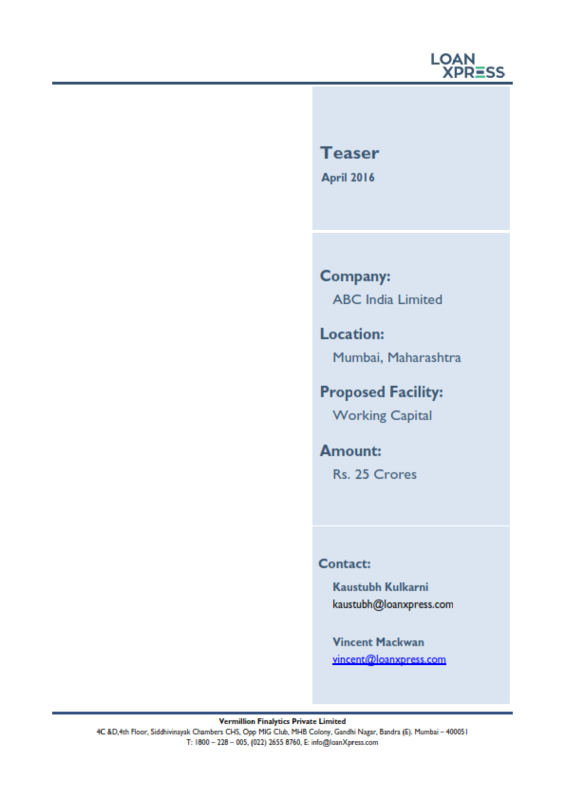 Based on the teaser, a lender - Banks/NBFCs decide if a project is doable or not. Email us your requirements at info@loanxpress.com and a LoanXpress Executive will get in touch with you to understand your proposal and prepare a perfect snapshot that would be ready to be pitched to the banks. To know more about the charges, you can either email us on our info id or call us on 022-2655 5992.
Credit Monitoring Arrangement (CMA) data is a very important area to be understood by a person dealing with finance in an organization. 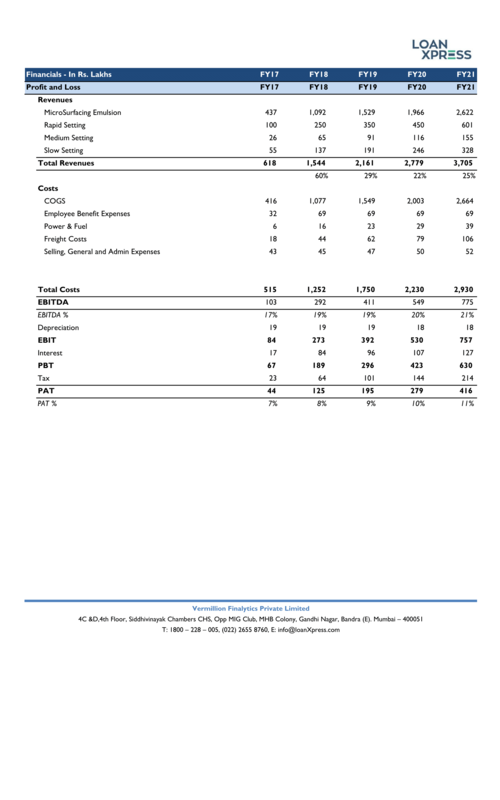 It is the critical analysis of the current & projected financial statements of a loan applicant by a banker. It is a systematic analysis of working capital management of a borrower and the objective of this statement is to ensure that the long term & short term funds have been used for the given purpose. That is why most of the Banks are still highly dependent on CMA. Email us your requirements at info@loanxpress.com and a LoanXpress Executive will get in touch with you to understand your proposal. CMA data will be prepared as per the industry norms and in a format that is accepted by the banks. Companies and organizations often utilize business presentations as a means of selling an idea or product, for training purposes, or to motivate the audience. Since a lot can ride on a presentation, a company presentation should be crisp, clear, informative & attractive. People are drawn to the visually appealing, so how something looks is crucial to how it's understood. Email us your requirements at info@loanxpress.com and a LoanXpress Executive will get in touch with you to understand your proposal. 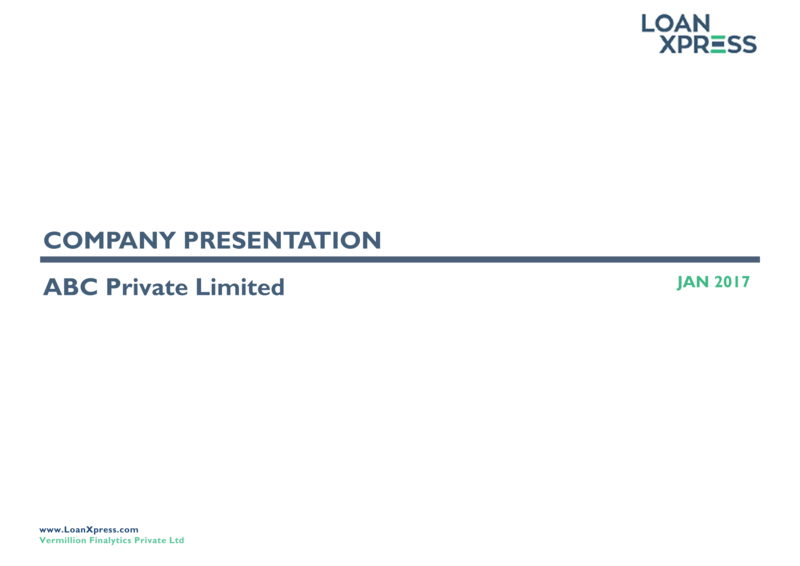 At LoanXpress we enhance the visual appeal of your ppt in a way such that it transforms the atmosphere at your business meeting into an enriching experience for your audience. The project report is a document, which gives an account of the project proposal to ascertain the prospects of the proposed plan/activity. The project report contains detailed information about, the land & building required, manufacturing capacity per annum, manufacturing process, requirements of raw materials, cost of the project and production, financial analyses & economic viability of the project etc. 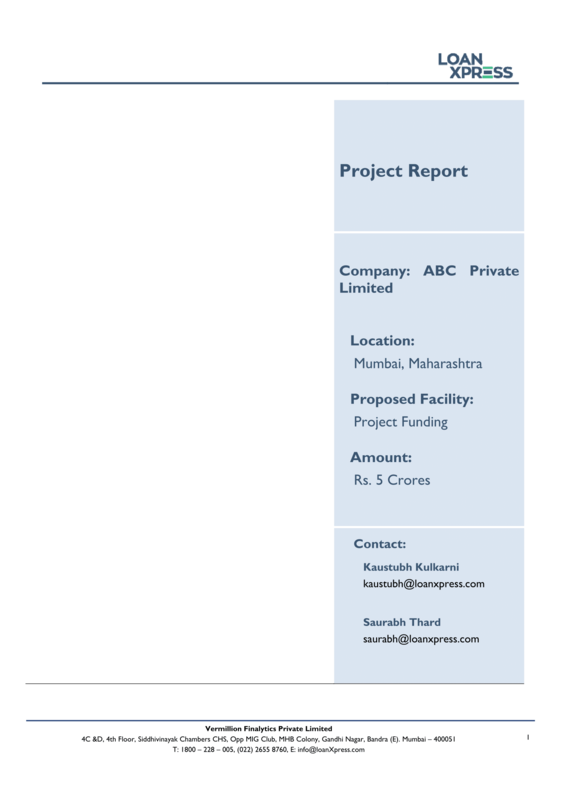 Detailed project report is a complete document for investment decision-making, approval, planning whereas feasibility study report is a base document for investment decision-making. It is base document for planning the project and implementing the project. Email us your requirements at info@loanxpress.com and a LoanXpress Executive will get in touch with you to understand your proposal. Our Project report services are the best when it comes to applying for a new loan. A project report consisting of the whole costing of the project & the economic & financial viability of the project will be provided. A financial model is anything that is used to calculate, forecast or estimate financial numbers. The financial model usually projects the balance sheet, income statement and cash flow statements monthly for a period of three to five years. 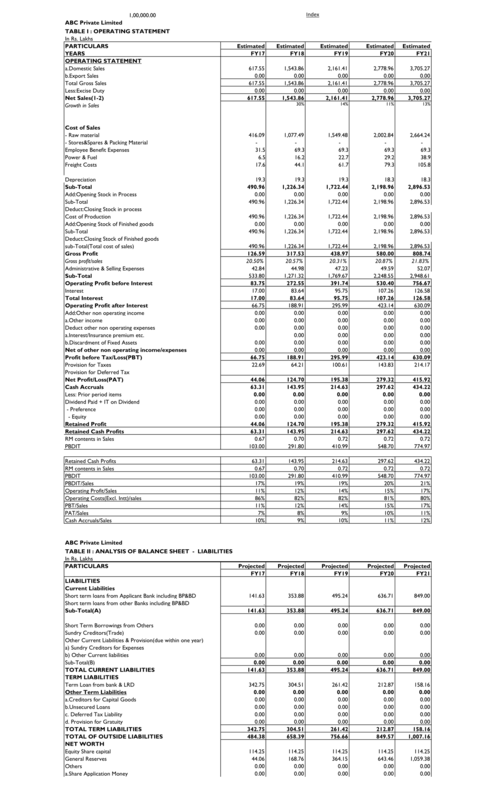 A good financial model provides all the key assumptions and allows the user to run sensitivity analysis by changing one or several assumptions at one time and see the overall results on the projected numbers. The model is used by investors, corporate acquirers, and banks to assess a transaction's merits and ultimately determine if a deal is worth pursuing further. Email us your requirements at info@loanxpress.com and a LoanXpress Executive will get in touch with you to understand your proposal. At LoanXpress we assist you in preparing the financial model right from scratch. An IM is a document provided by a company to prospective investors after the investors have reviewed a brief Investment Summary, or "teaser", and signed a Confidentiality Agreement. An IM allows the owners of a company to present a comprehensive, accurate, and attractive picture of a company. The more information that finds its way into the IM, the less need there is for investors to pose written questions, saving time for both the involved parties.